Less than a month after the fabulous OER15 conference in Cardiff and we’re already thinking ahead to next year’s OER16 event which will be taking place in Scotland for the first time in the conference’s history. The event will be held at the University of Edinburgh, an institution with along tradition of education innovation and openness. I’m delighted to have the opportunity to co-chair the conference along with Melissa Highton, Director of Learning, Teaching and Web Services at the university. 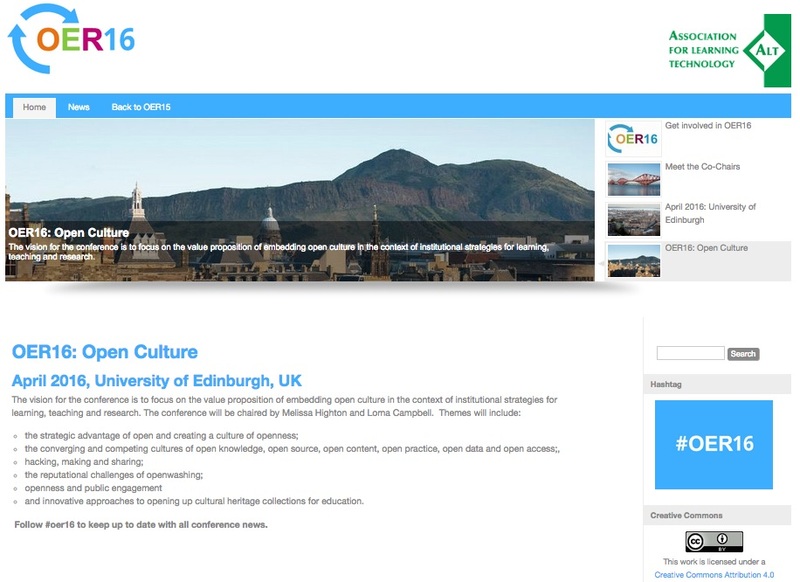 We’re still in the process of working with ALT to finalise the date for the conference so please keep an eye on the conference holding page and hashtag #OER16 for announcements. We’re also looking for open practitioners and like minded sorts from all sectors of education to join the conference committee and to help us shape the event. If you’d like to get involved you can sign up here: Join the OER16 Conference Committee. and innovative approaches to opening up cultural heritage collections for education. I’m also particularly keen to encourage colleagues from libraries, archives, museums, and the cultural heritage sector more widely, to get involved so we can learn from each others’ experiences of openness and start to break down barriers across these sectors. I’ll be posting updates about OER16 here as planning progresses, so watch this space and please do sign up and get involved.